Hertz has reported revenue growth for the past seven quarters and suspects its substantial revenue growth will be boosted by its acquisition of Dollar Thrifty. Hertz Global Holdings Inc., the rental car operator making a $2.3 billion buyout bid for Tulsa-based Dollar Thrifty Automotive Group Inc., reported third-quarter net income of $242.9 million on Wednesday, a 14.3 percent increase compared with 2011’s third quarter. Hertz is in the process of acquiring Dollar Thrifty. Photo by Michael Gray. Hertz’s earnings per share in the third quarter were 55 cents versus 47 cents in the same quarter last year. Revenue in the quarter ending Sept. 30 was $2.516 billion, up 3.4 percent from $2.43 billion in the comparable period a year ago. Worldwide car rental revenue in the third quarter increased 2.1 percent compared with 2011’s third quarter, to $2.15 billion. Third-quarter revenue from worldwide equipment rental was $363 million, a 12.8 percent year-over-year increase, driven by an 18.6 percent revenue increase in the United States and a 17.1 percent increase in North America. Hertz Chairman and CEO Mark P. Frissora said the company established record worldwide car rental revenue in the third quarter. Hertz also posted the seventh consecutive quarter of double-digit year-over-year revenue growth in worldwide equipment rentals, the CEO said. “I am especially pleased with our ability to improve the consolidated adjusted operating margin 260 bps (basis points) in the third quarter despite soft global macro economic conditions,” Frissora said. A basis point is a unit equal to 1/100 of 1 percent, and a 1 percent change equals 100 basis points. In September, Hertz bolstered HERC’s position with its acquisition of Pioneer Equipment Rental and Sales of Ponca City, the state’s largest independent equipment rental firm. Executives of Park Ridge, N.J.-based Hertz did not disclose a buyout price, but they said Pioneer Equipment will add $25 million of annual revenue to HERC, its wholly owned subsidiary. Frissora said the Pioneer acquisition brings to 12 HERC’s number of Oklahoma stores while advancing its industrial penetration strategy, particularly in the oil and gas market. Hertz offered $2.3 billion, or $87.50 per share, in August for outstanding shares of Dollar Thrifty, the nation’s fourth largest rental car company behind Enterprise Rent-A-Car, Hertz and Avis Budget Group. The Hertz offer was approved and accepted by the boards of directors of both companies. After initially expecting antitrust approval of the Dollar Thrifty deal by the Federal Trade Commission in mid-October, Hertz has twice extended the expiration date of its tender offer. Last week, Hertz extended the expiration date of its tender offer to Nov. 5, and company executives said they will continue to extend it until a decision is reached by the FTC. But Hertz’s confidence that its divestiture of its Advantage discount rental car brand would pass antitrust muster at the FTC is being tested. 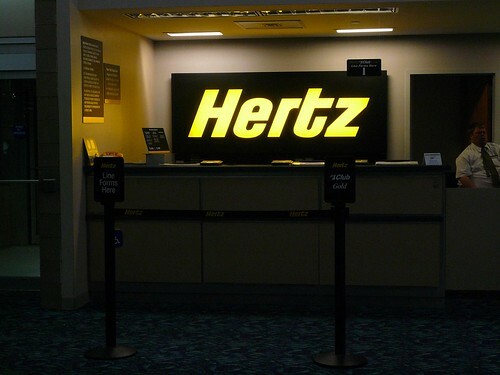 Some industry observers believe the FTC may require Hertz to divest more of its rental car holdings — including possibly the Thrifty Car Rental brand — to win approval of the Dollar Thrifty transaction. Hertz, Enterprise and Avis Budget together control about 75 percent of the market. Dollar Thrifty has about 5 percent of the U.S. market, said IBISWorld in Santa Monica, Calif.
Dollar Thrifty employs 780 people at its corporate offices at 5310 E. 31st St., and it has 6,000 workers companywide. Hertz has 24,000 employees, including 1,700 at a regional center in Oklahoma City. Dollar Thrifty shares closed Wednesday at $77, down $2.08 or 2.6 percent. Hertz shares dropped 10 cents, closing at $13.27. Source: Hertz Global Holdings Inc.
(c)2012 Tulsa World (Tulsa, Okla.). Distributed by MCT Information Services.